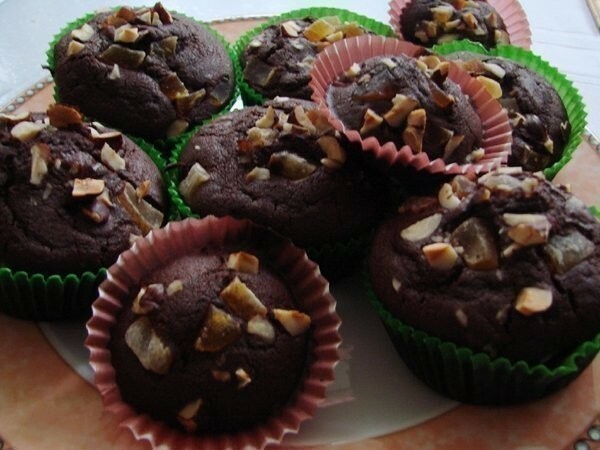 dark muffins with a fruity taste! Very easy and quick recipe! Put your paper cupcake cups into the molds or baking pan, whatever you're baking in. Combine the dry ingredients into a mixing bowl and mix them with a large spoon. Combine the wet ingredients into a different bowl and mix them. Pour the wet ingredients into the dry ones and mix well to avoid lumps. The mixture should be more on the liquid side, nice and pourable. If you're happy with the mixture you can proceed to pour the mixture into the paper cups, filling the half of the paper cup or 3/4 of the cup, as you wish. You can sprinkle some fried nuts on the top if you like. Preheat the oven at 180Ë™C. Put the muffins in for about 15 minutes.